The Kev and I met in London–we were both living in a formerly condemned council block repurposed as student housing. An early date involved listening to music by the light of the fire…the fire started by local kids in the trash bins outside his window. Romance! Not knowing whether I would return to London after my program, I visited everything I might ever want to see there. One of my favorites was the west cemetery at Highgate. Highgate is a Victorian cemetery that fell into ruin during the 20th century. When it was restored, the goal was to arrest it in its decayed state rather than to return it to as-new condition. The result is atmospheric and unforgettable. …and my jaw dropped. 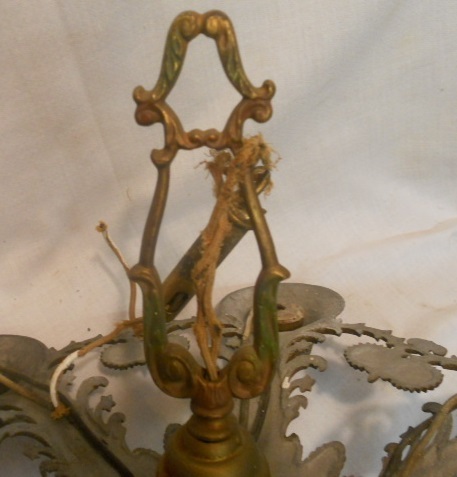 It was part of a 1920s or 1930s light fixture, but significantly worn and water damaged. The seller (Curios of Wonder–great stuff, check it out) recommended using it as a candle stand, but I immediately and ardently desired it as a light fixture in my house, complete with the oxidation and wear. I couldn’t click to payment fast enough! 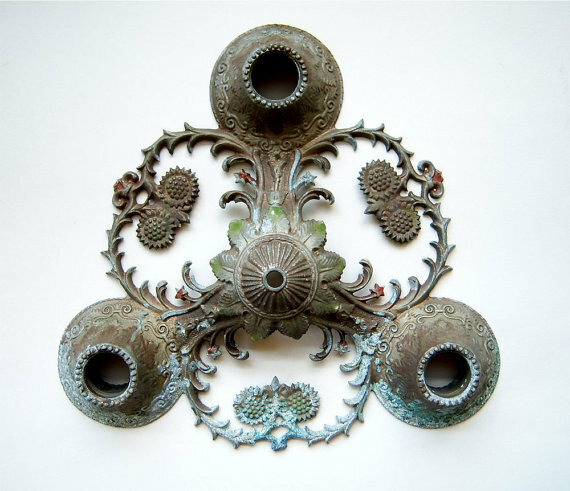 Here’s an excellent example of what makes us individuals–most of you probably see, at best, a faintly decorative hunk of metal, but for me, this Etsy listing kicked off an obsession with vintage light fixtures. Victoria Elizabeth Barnes has enormous mirrors, and I have ceiling lights. We both trawl Craigslist, but my stuff is much easier to transport–plus, I can usually spring my purchases on the Kev after the fact. These are practicalities worth considering when lighting on an obsession. Since I loved the piece as it was, I just rubbed it down with a little matte wax before considering how to put it back into operation. 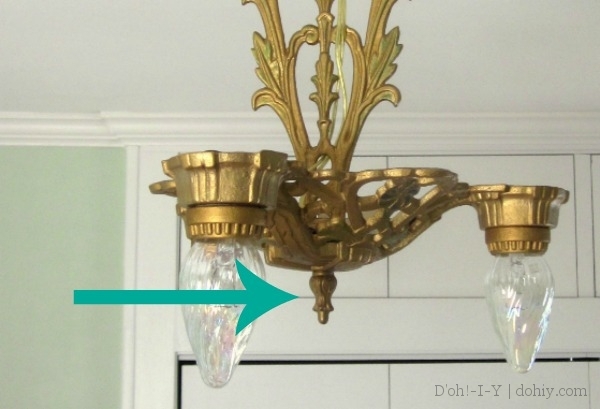 This lower “pan” part is usually all that remains from this type of fixture. Originally, the light would also have had a large, rigid finial between the pan and the canopy to make it hang straight. The fixture I later did for our bedroom had this piece. 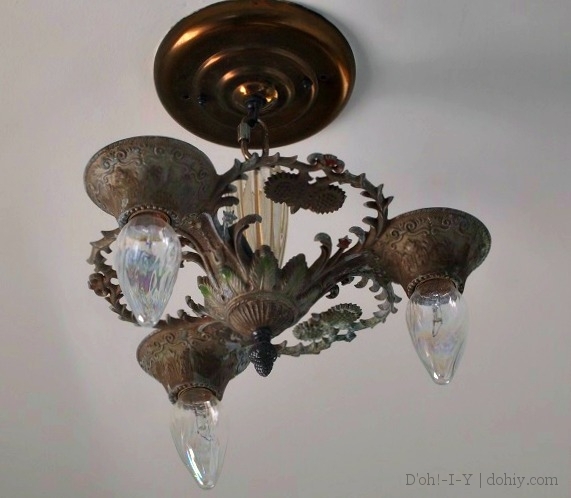 This one was a complete restoration–there was nothing lovely in how this fixture had been mistreated. It also would have had a coordinating hold-up nut/finial. Our bedroom fixture did not have this item, but acceptable replacements are easy to find. I bought a leafy version and Rub-n-Buffed it to match. I was trawling eBay for acceptable replacements for the sunflower fixture when I ran across the five-light version in perfect shape with both finials intact. Here’s what they would have looked like. This photo and the next via. 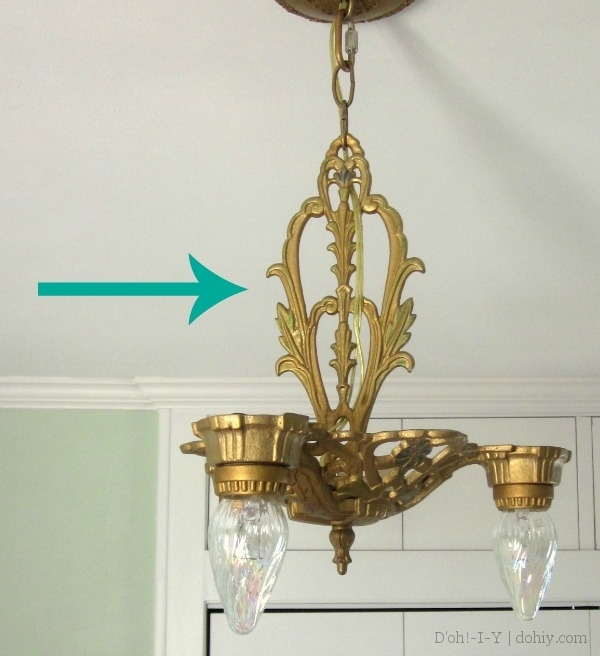 I wrote elsewhere about ceiling canopies for old fixtures; those are usually missing as well. I didn’t bid on this fixture because thing one, CHA-CHING, and thing two, I wouldn’t break up a perfect set. It’s truly strange to me that the pan should generally survive but not the other parts! If the fixture were taken down, all these pieces would just screw together, so they should simply be found together for later salvage or sale. It’s easy to buy a serviceable nut, but what happens to the upper finials? They rarely show up in vintage shops or online auction sites by themselves, and I haven’t found anyone who makes replacements. Since the upper finial was missing here, I used a glass column from a broken fixture lingering in the basement. I ran threaded lamp tubing through the center of the piece, drilling holes near the ends. The hole near the bottom (but above the fixture’s base) allowed wiring to travel up through the center, while the holes through the top would accommodate the chain (with the wire simply exiting the top of the tube). Pre-drilling/pre-assembly mock-up. Spacer nuts between the pan and the column now give the column more height (and I used a longer threaded tube). Also, look…it was summer then! This is not a particularly accurate solution — glass columns go with glass light shades, metal finials with metal pan fixtures — but until I find or somehow make a top finial that will work with the pan, I like my Franken-fixture. The motif is delicate, and the glass column does not overwhelm the piece. 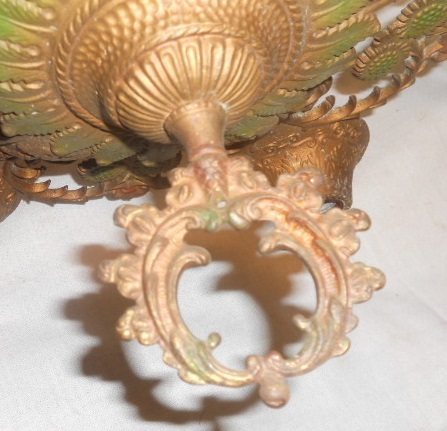 I used a widely available acorn finial to hold it together (painted from bright brass to bronze), and a vintage ceiling canopy left in the house by the former owners. 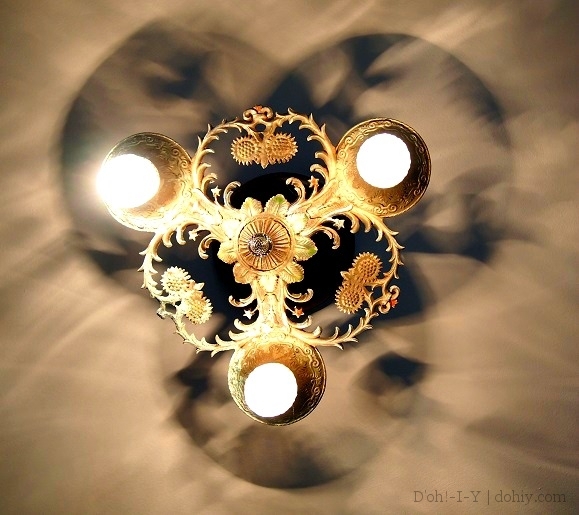 I love the patterns these fixtures make on the ceiling — part of the whole effect. As I mentioned in the bedroom fixture post, I’m not an electrician, so I don’t want to provide wiring instruction, but if you are interested, you can see how it’s done here, here, or here. 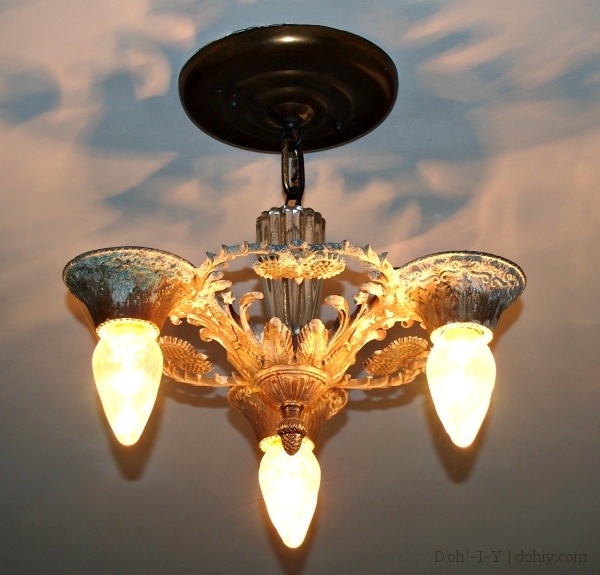 A note on exposed-bulb fixtures: yes, these currently contain incandescent bulbs. We do not use overhead fixtures for more than a couple of minutes a day, if that–these fixtures are mostly house jewelry. I’m swapping over to LEDs house-wide, focusing on higher-use fixtures first and keeping an eye out for LED deals. Most likely, these fixtures will be sporting something like the bulb on the left in future (available here). I like that brass detail around the base! 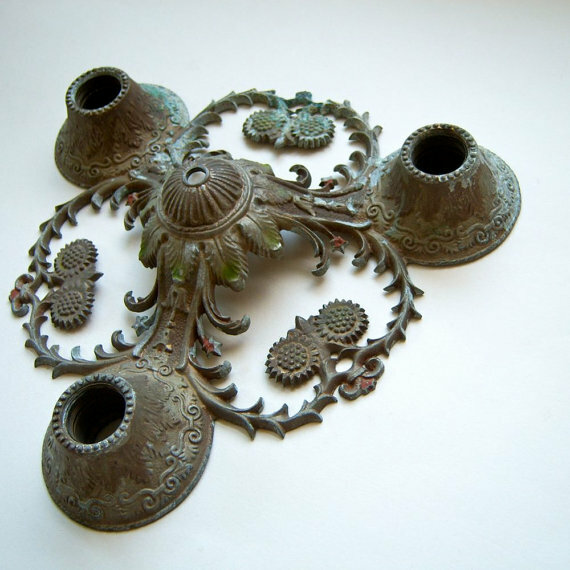 If you are interested in vintage lighting, eBay and Etsy are good places to find parts, as are architectural salvage shops. Many people restore and rewire old fixtures if you don’t want another project. If you do, parts and advice can be found at Antique Lamp Supply, Grand Brass, and MyLampParts. How obsessed am I? My next restoration candidate is already waiting in the workroom. Twenty dollars on Craigslist–how could I pass that up? What’s your particular house obsession? 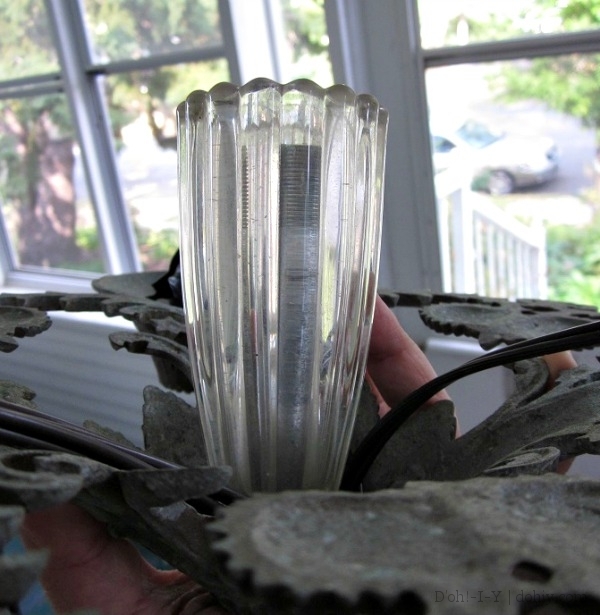 This entry was posted in Before & After, Decor, Electrical, Romance, Salvage and tagged 1920s light fixtures, 1930s ceiling lights, art deco light fixtures, bungalow ceiling lights, rewiring old light fixture, upcycling old light fixture. Bookmark the permalink.